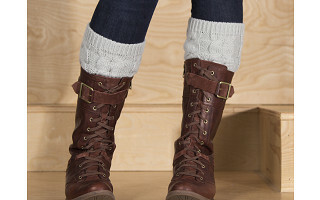 Get the cute-meets-cozy look of tall socks under boots without feeling squeezed. The boot cuffs from The Royal Standard deliver the same layered look without adding any extra bulk. From ankle booties to knee-high riding boots, the cuffs work with just about any style, and can be worn straight or folded over. The classic cable knit adds a dose of on-trend chunky texture, too. Top off your boots with cuffs for an easy, warm, comfy finishing touch. 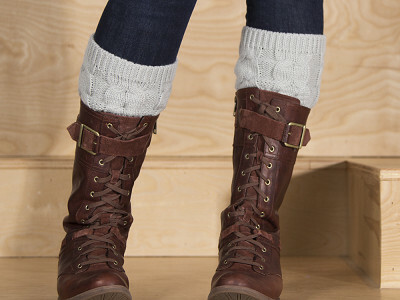 Get the cute-meets-cozy look of tall socks under boots without feeling squeezed. The boot cuffs from The Royal Standard deliver the same layered look without adding any extra bulk. From ankle booties to knee-high riding boots, the cuffs work with just about any style, and can be worn straight or folded over. The classic cable knit adds a dose of on-trend chunky texture, too. Top off your boots with cuffs for an easy, warm, comfy finishing touch.